Sailing Obsession: Crisis! Our Air Conditioner Is Broken! Crisis! Our Air Conditioner Is Broken! Yes, we have air conditioning on our boat. You could think that this means we're totally spoiled, and you could start rolling your eyes as soon as I complain about having problems with air conditioning. And you'd be right. But, on a boat when it's humid, there is actually a very practical reason for having air conditioning beyond our own comfort. When you live on a boat humidity is always a problem. Being in a marine environment, adding on the moisture produced by people just living and cooking is enough of a challenge. On humid days, the small, mostly sealed environment on a boat seems to compound the humidity. And what does humidity lead to? Mildew. 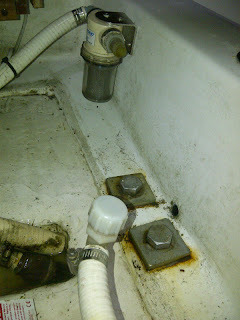 Keeping mildew at bay is a constant challenge on board. Living in Canada, it isn't nearly as severe a problem as it is in the tropics, but it is something that can creep up on you. And once an area is infected, as much as you clean, it seems to come back twice as rapidly. So, the air conditioning actually helps keeps the boat in good shape. But, late last season, we noticed that our air conditioner was not working as well as it should have been. This spring, I didn't have the time to look into it, so the boat went in the water without it being fixed. Now, the weather has been getting warmer, and the humidity increasing, so it was time to tackle the problem. First step was to double-check that it isn't working. The system on our boat is essentially a heat pump that uses sea water. Sure enough, when we started it up, the water flow through the system was not nearly as much as it should have been. That suggested two things - either a problem with the pump or a plugged line. I decided to check the pump first. There are only a couple of screws holding the face of the pump on, so it took this off to see if there was any problem with the pump. Everything looked fine, so I put it back together again. Next step is to investigate a possible plugged line. This possibility kind of worried me, since if there were some weeds or debris that somehow got through the filter and into the heat exchanger, this could be difficult to fix. But a quick test showed that the problem was in the line before the pump. I drained the system of water, then watched what happened when I opened the water valve to refil the system. The water in the filter (which is transparent) was entering very slowly. So the plugged line was fortunately in a more accessible place. There should be a hose connecting these two parts. That only left a couple of options, so it was pretty easy at that point to track down the location of the problem. I took off the line going into the filter, and sure enough, it was fully plugged with weeds that had been drawn into the system. Unfortunately, I had to cut off the line to remove it, so I needed a replacement. A quick trip to the hardware store, and a new water line was installed. I replaced the previous solid line with a transparent water hose, so now it's very easy to keep an eye on the problem and clean the line before it clogs again. And, yes, I agree. I feel very spoiled having air conditioning on a boat. Where are you guys? We are crossing the border on July 11. Doing a caravan with Airstream in Newfoundland for 2 months. Very clever to use a clear line for a quick visual inspection in the future. Having an ac repair waccabuc contractor that you trust and can depend on to do a good job is important. When you find yourself in need of a contractor, use these tips.